Background: Orbital decompression is an important surgical procedure for treatment of Graves’ ophthalmopathy (GO), especially in women. It is reasonable for balanced orbital decompression of the lateral and medial wall. Various surgical approaches, including endoscopic transnasal surgery for medial wall and eye-side skin incision surgery for lateral wall, are being used nowadays, but many of them lack the validity, safety, or cosmetic effect. Patients and methods: Endoscopic orbital decompression of lateral wall through hairline approach and decompression of medial wall via endoscopic transnasal surgery was done to achieve a balanced orbital decompression, aiming to improve the appearance of proptosis and create conditions for possible strabismus and eyelid surgery afterward. From January 29, 2016 to February 14, 2017, this surgery was performed on 41 orbits in 38 patients with GO, all of which were at inactive stage of disease. Just before surgery and at least 3 months after surgery, Hertel’s ophthalmostatometer and computed tomography (CT) were used to check proptosis and questionnaires of GO quality of life (QOL) were completed. Findings: The postoperative retroversion of eyeball was 4.18±1.11 mm (Hertel’s ophthalmostatometer) and 4.17±1.14 mm (CT method). The patients’ QOL was significantly improved, especially the change in appearance without facial scar. The only postoperative complication was local soft tissue depression at temporal region. Obvious depression occurred in four cases (9.76%), which can be repaired by autologous fat filling. Interpretation: This surgery is effective, safe, and cosmetic. 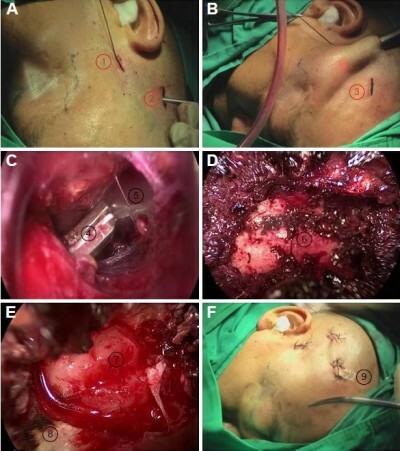 Effective balanced orbital decompression can be achieved by using this original and innovative surgery method. The whole manipulation is safe and controllable under endoscope. The postoperative scar of endoscopic surgery through hairline approach is covered by hair and the anatomic structure of anterior orbit is not impacted.